Working at institutional, community & civil society levels to show that Europe’s most marginalized population is worthy of basic human rights, social services and respect. Battling the traditional approach that treats the Roma as a separate ethnic group, Carlo Stasolla works at the institutional, community and civil society levels to show that Europe’s most marginalized population is worthy of basic human rights, social services, and respect. Carlo is improving life for the Roma in Italy—traditionally treated as a separate, isolated ethnic group—by advocating for their basic human rights, inclusion in society, and access to established social services. By reframing their exclusion as a violation of human rights, Carlo is changing the way governments and society view the Roma. Through his organization, Associazione 21 Luglio, Carlo wants to abolish the so-called “Roma camps” and redirect funds allocated to managing the camps system toward inclusion projects. Carlo works on three levels: creating strategies to integrate the Roma at institutional and civil society levels; empowering the Roma to learn about their civil rights and how to access welfare services; and shifting the common perception of the Roma through working with the media. In 2016, Associazione 21 Luglio presented a policy paper containing a concrete plan for the closure of Roma camps within five years and the complete desegregation and inclusion of Roma people into Italian society. This led the City Council of Rome to adopt the “Plan to Overcome Roma Camps,” where, for the first time, a local government officially planned to close the camps and integrate the people living there into society. Through his awareness-raising and advocacy work, Carlo has been instrumental in changing the treatment of Roma at the national level. Since 2014, more than $750,000 has been moved from maintaining the camps to inclusion projects in Italy. In 2018, nine municipalities started the process of closing the camps and integrating the residents into society. Carlo, through Associazione 21 Luglio, adapted his methodology to European contexts and wants to scale his impact across Europe within the next five to ten years. 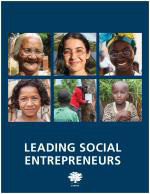 Carlo' s story appears in the 2018 edition of "Leading Social Entrepreneurs" which features a selection of just a few of the Ashoka Fellows recently brought into the largest global network of social entrepreneurs. The LSE presents some of the newest innovations by leading social entrepreneurs whose ideas are changing the way things are done all over the world.